Everyone who knows me knows I like to argue. I don’t mean fight — I mean argue, debate. I like to engage people with opinions unlike my own in an effort to persuade them. Okay, maybe I like it too much. Regardless, you may notice that there’s not a lot of arguing here on this blog. I guess most people would say that’s a good thing, but sometimes I find it a little boring. That’s why I appreciate Bridget, who was willing to jump in and offer an opposing point of view on the Homeschool vs. Public School infographic I posted some time ago. I’m going to use Bridget’s comment to illustrate an important logical fallacy, but I want to be clear: I don’t wish to demean or insult her. Her error is an enormously common one and by no means embarrassing. I’ve done it myself. I just thought it would be useful and interesting to write about it. But I harbor no ill-will toward Bridget. Just the opposite — I like people who speak their minds — especially when it gives me an opportunity to argue. Now, it’s possible that Bridget has identified a statistic in the graphic that is inaccurate or misleading. If so, I hope she tells me which one. But since she gives me no more than this sentence, I am going to assume she isn’t, in fact, aware of any particular inaccuracy, but only assumes the data is “clearly skewed” because the graphic was created by a company called College@Home. This is an example of an informal logical fallacy known as the genetic fallacy. A genetic fallacy rejects a conclusion based solely on its origin — where it comes from or who asserts it. In other words, Bridget assumes the data in the graphic is “clearly skewed” because it was provided by a company with an interest in promoting homeschooling. In other words, you must show that a man is wrong before you start explaining why he is wrong. The modern method [Note: This essay was written in 1941.] is to assume without discussion that he is wrong and then distract his attention from this (the only real issue) by busily explaining how he became to be so silly. In the course of the last fifteen years I have found this vice so common that I have had to invent a name for it. I call it “Bulverism.” Some day I am going the write the biography of its imaginary inventor, Ezekiel Bulver, whose destiny was determined at the age of five when he heard his mother say to his father – who had been maintaining that two sides of a triangle were together greater than the third – “Oh, you say that because you are a man.” “At that moment,” E. Bulver assures us, “there flashed across my opening mind the great truth that refutation is no necessary part of argument. Assume your opponent is wrong, and then explain his error, and the world will be at your feet. Attempt to prove that he is wrong or (worse still) try to find out whether he is wrong or right, and the national dynamism of our age will thrust you to the wall.” That is how Bulver became one of the makers of the Twentieth Century. I find the fruits of his discovery almost everywhere. Thus I see my religion dismissed on the grounds that “the comfortable parson had every reason for assuring the nineteenth century worker that poverty would be rewarded in another world.” Well, no doubt he had. On the assumption that Christianity is an error, I can see clearly enough that some people would still have a motive for inculcating it. I see it so easily that I can, of course, play the game the other way round, by saying that “the modern man has every reason for trying to convince himself that there are no eternal sanctions behind the morality he is rejecting.” For Bulverism is a truly democratic game in the sense that all can play it all day long, and that it give no unfair advantage to the small and offensive minority who reason. But of course it gets us not one inch nearer to deciding whether, as a matter of fact, the Christian religion is true or false. That question remains to be discussed on quite different grounds – a matter of philosophical and historical argument. However it were decided, the improper motives of some people, both for believing it and for disbelieving it, would remain just as they are. Maybe that’s too much of a quote. Sorry. But I hope you get Mr. Lewis’s point. Bulverism is no less common today than it was in his day. 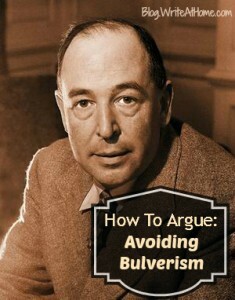 Anytime a debater makes a comment beginning with, “You only say that because you are…” prepare yourself for Bulverism. Once you learn to identify Bulverism, you are likely to find it everywhere. At least everywhere there is an argument. Whatever the topic — politics, education, religion, economics — it’s all too common to dismiss a position by denigrating the proponent. Democrats only support welfare because it wins them votes. Republicans only oppose welfare because they support the wealthy. On and on. Do you see how such methods of argumentation get us nowhere? It focuses the discussion on the arguers and off the actual point of debate. Some say we need less arguing in our society. They think we need to just get along and agree to disagree. I disagree. I don’t think we need less arguing, but better arguing. Maybe, just maybe, it will help us all get closer to the truth. As always, I’d love to hear from you. Especially if you want to argue with me! The 100 Words Every High School Freshman Should Know Quiz! I am SUPER excited by the post and hope you will do more in a series of something like – why Logic makes you a better writer, or HoW Logic can make you a better writer. or how to persuade anyone of anything. I don’t know. But I would like to understand more the practical usage of logic in dialoging. I guess I can be accused of being an arguer, I don’t receive it, because I honestly don’t like to argue for the sake of it, or for being right, I truly want dialog and dialectic discussion. This is how I learn best and grow. I see it as the basis for the foundation of our country. Everyone was informed, self-responsible for that knowledge, and then “argued” – dialoged to my thinking – passionately without taking or giving offense. And there were many fallacious arguments during the proceeding years in campaigns and newspapers, but people were still able to see them and counter them. It wasn’t long though before people stopped caring and went about worrying with the price of fabric or the joys of leisure, those previous years had begun to afford them. I did want to say in this fashion to the argument that the graphic was inaccurate based upon the “prejudiced” company, that there would be no graphic then that could be informative because as shown through your post, there would be no one who hadn’t been swayed one way or the other – we either have been educated in our out of the system, and we either have children in or out of th system. If we were to invoke a CEO of say a chicken company, who had no children (we’ll give him an education in BOTH systems), then would we not say of him – he is NO expert, he is not IN the education industry. – isn’t this just another form of disqualifying the arguer without having to address the argument? Good questions, Jim. Technically, an ad hominem is a type of genetic fallacy (which is a type of red herring) and Bulverism is a subtle kind of ad hominem. There’s no real science to all this, but an ad hominem is an attack on the arguer rather than on the argument. Bulverism is more a way of dismissing an arguer on the assumption of bias rather than making an overt attack on him or her. Thanks for this post. Very helpful. First, what is the difference between an ad hominem argument and a Bulverism (genetic fallacy)? Second, it seems to me that not only do we see this form of argument in the public square, it also seems to have become the fundamental assumption of much post modern argument. Take, e.g., the claim that I learned back when I was studying Family Therapy. “Everything that is said is said by somebody.” i.e. you can in no way separate what a person says from the the person saying it, i.e. from his/her interests. The extreme form of that would be that every statement is designed to bolster the speaker’s position in terms of power and greed. No one is disinterested in saying anything. Leave a Reply to poorva bakshi Click here to cancel reply.